The story starts off well. Two young white men meet in college and make a strong, but unlikely, connection through their shared love of music. Seth, from whose perspective the story is mostly told, is the low income antisocial kid who proves to be great making equipment and recording with it, but little else. Carter, a charming and handsome trust-fund kid, fancies himself a connoisseur focusing on African American music, the older the better. With Seth’s studio talents hitched to Carter’s money and music tastes, the pair embarks on a journey to create sonic art in New York City. Seth spends his time walking around NYC with a hidden microphone/recorder, capturing busker performances and sampling the sounds of the street. Carter indulges in record collecting, searching out B-sides and rarities that the pair can mix into their productions. As they immerse themselves more in the music world, Seth becomes more focused, and Carter becomes more obsessed. They make a mock-up of an old blues song and credit it to a mystery musician that Carter invents named Charlie Shaw. Then they put the tune on the Internet and watch it disseminate, fooling every listener into thinking the song is a long lost gem from the South. For all the positive attention they receive, some bad hoodoo starts coming their way as well. An old record collector claims Charlie Shaw is real and that the pair has unearthed a great danger. When they contact the elderly man and investigate his claims, tragedy soon strikes and a dark downward spiral into America’s music history begins, one where abuse and theft ran rampant and the rightful futures of genius black artists were denied by racial barriers and widespread bigotry. 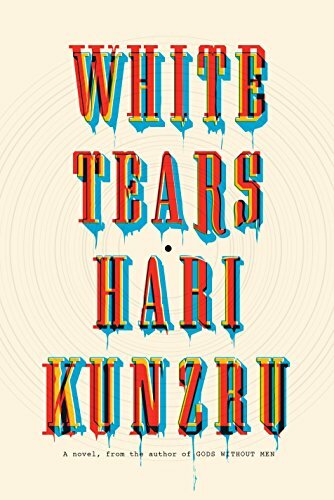 White Tears is definitely a book of two halves. The first half is enjoyable; great character building for the two mains, plus an exploration of the themes of wealth, privilege, class systems, and cultural appropriation. However, midway through the novel changes gears and the second half suddenly becomes a vehicle for a paranormal-esque thriller/horror tale of revenge that hasn’t been primed properly by the first half. As a result it often doesn’t work very well. There is a shifting of perspectives as well as a shifting of time and place to try and achieve an unsettling back-story that parallels parts of the main story. Instead of tumultuous and disjointed, it comes off confusing and incomprehensive. Within this pinball mechanism of a plot, the novel ricochets toward an end most readers won’t see coming, but that has more to do with increasing incoherence and sudden revelations that come very late in the game. Our suspension of belief is sorely tested by weak plotting and messy mechanics. Furthermore, on the surface it might seem that Kunzru has done his homework, but it becomes apparent that he has never been immersed in music to the degree that he should be writing so in depth about it. People in the music business will sense and spot faults in this novel; the weak grasp of audio engineering, incessant name-dropping, and what amounts to a scratching of the surfaces of studio, music, and production work. There are some interesting ideas, such as radio pioneer Guglielmo Marconi's theory that sound never actually dies (instead continuing on indefinitely, becoming forever quieter and drowned out by newer sounds), but it isn’t enough to keep the idea behind Charlie Shaw’s revenge afloat. There’s no denying that Kunzru can write. His prose has great flow, and the pace of his storytelling has a compelling urgency. Dialogue is mostly on the strong side, and he tackles some tough questions (and even harder answers). But the delivery of his message is heavy-handed and often poorly executed. That being said, this book will receive much positive attention due to the author's pedigree and for taking on the tender subject matter of American cultural appropriation and racism, but that fact remains that this novel staggered under the weight of its own ambitions, and the narrative suffered from its own intentional confusion. When all is said and done, White Tears is a great book to get into . . . but not such a good one to get out of.